First, the decision letter of the court in Mainz (full pdf-version here). 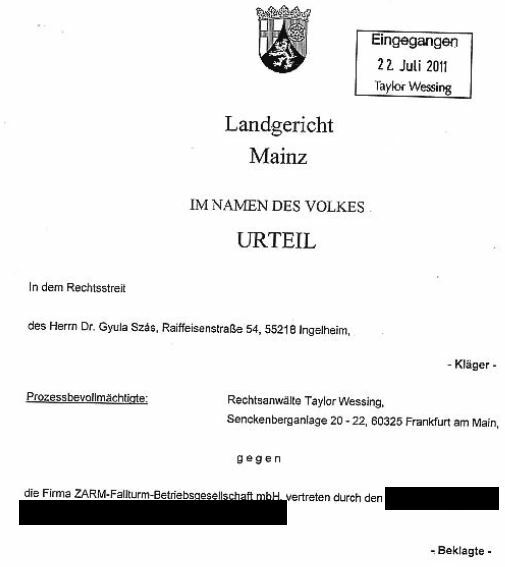 Second, a the expertise of LMU Munich, requested by the court in Mainz (full pdf-version here). Interesting news were published in the german Journal Stern in April 2016 (link to article). Der Satellit “Microscope”, am Montagabend gestartet, stellt eines der ältesten Naturgesetze auf den Prüfstand – das Fallgesetz. 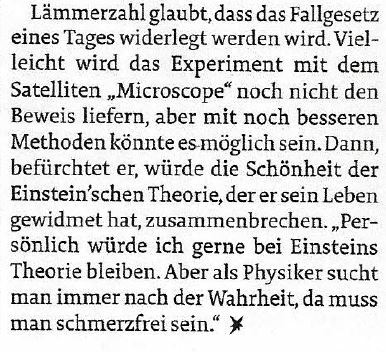 Erweist es sich als falsch, wackelt das Fundament der Physik. “Wenn wir einen Unterschied messen, dann wird die Allgemeine Relativitätstheorie infrage gestellt. Eine der wesentlichen Grundpfeiler unseres Weltbildes würde wackeln und wir bräuchten eine neue Theorie”, sagt Hanns Selig. In the hard copy of the Journal from 28th April 2016 (page 124-126) you can find the statement of Prof. Lämmerzahl, the General Director of the Drop Tower Operation and Service Company and Director of Space Science of the drop tower (ZARM). The scientist at ZARM worked the last 15 years on this 130.000.000€ project. Can you think of the desaster if a lone physicist like me worked out a consistent theory and performed an experiment that would make their project worthless? Of course one would impede the lone scientist efforts to continue his attempts to reproduce the experiment. Please check you the youtube-Video of my drop experiment that falsifies the universality of free fall in the drop tower at ZARM in Bremen already 2004. It shows that different elements accelerate differently in earths gravitational field. And see my lecture that explains parts of the theory in simple words. This is all part of the Atomistic Theory of Matter that I hope one day substitutes the current energetic physics of Albert Einstein.